With airlines cutting back on capacity, planes are flying with record passenger loads. Chances of snagging an empty middle seat are slim and none these days. 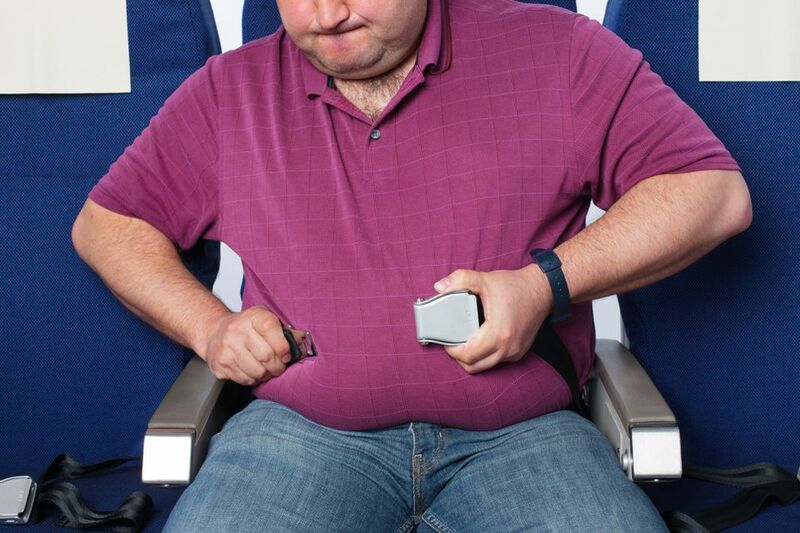 A scarcity of seats can cause major problems for overweight passengers who may need extra space. Air Canada offers extra seats for free to those who require extra seating because they are disabled by obesity or because they must accommodate another disability. In order to get seats on Air Canada or Air Canada Express flight operated by Jazz or Sky Regional, travelers must print a copy of the Air Canada Fitness for Travel form and follow the instructions. Aeromexico did not have specific information on its website for overweight passengers. But under special needs, it did note that it offers seats with mobile arm rests that allow passengers with wheelchairs to move easily to and from their seats. The airline suggested that travelers reserve those seats as soon as possible and to check for availability when booking. Alaska Airlines requires travelers of size to buy an extra seat if they can’t comfortably fit within one seat with the armrests in the down position. The carrier says it can’t guarantee travel for those who require additional seat space on a given flight unless they buy a second seat in advance. Allegiant Airlines' seats are 17.8 inches wide between the armrests. If a traveler is unable to lower the armrest or can't fit into just one seat, they will be required to buy a second seat. If a flight is sold out, a passenger of size will not be allowed to travel in the interest of safety. American Airlines requires passengers to buy an extra seat if they require a seat belt extension and their body extends more than one inch beyond the outermost edge of the armrest. If a determination is made when the passenger arrives at the airport that an extra seat is needed, the airline will allow them to buy an extra adjacent seat, if one is available. The rules on Delta Air Lines are pretty simple. If a passenger is unable to sit in their seat without encroaching into the next seat while the armrest is down, they are encouraged to ask an agent to be re-seat next to an empty seat. It also suggests buying an upgrade to first or business class. Frontier Airlines asks that travelers who can't lower both armrests and/or who overlap into an adjacent seat or aisle to book two seats. If a Hawaiian Airlines airport customer service leader determines that a passenger can't fit into one seat, they will offer three options: buy two seats in advance; upgrade to business or first class; or work with customer service to find a seat assignment with an adjacent empty seat on the day of travel. JetBlue Airways doesn’t have a clear policy on its website. It notes that its seatbelts are 45 inches long, and it makes 25-inch extensions available onboard their aircraft. Southwest Airlines gives passengers of size who choose not to buy an extra seat in advance to discuss their needs with a customer service gate agent. If an extra seat is needed, the passenger will be accommodated with a complimentary additional seat. Fort Lauderdale, Florida-based Spirit Airlines does not have an official policy on how it handles overweight passengers that may need more room. But according to CheapAir.com, the carrier will either advise travelers to buy another seat or purchase its Big Front Seat, which is wider than normal coach seats. United Airlines is pretty strict when it comes to those needing extra space. If a passenger in coach can’t safely and comfortably fit in one seat, they will be required to buy another seat for each leg of their itinerary. The airline does allow the passenger to buy that second seat for the same fare as the original seat, provided they buy it at the same time. But a customer who doesn’t buy an extra seat in advance may be required to do so on the day of departure for the fare level available on the day of departure, which could be quite expensive. The airline also offers the option of buying a ticket in first or business class. The carrier notes on its website that it is not required to provide additional seats or upgrades free of charge. WestJet will, on a ​case-by-case basis, offer travelers an extra seat, but only if they require additional seating due to disabling obesity or certain medical conditions. But it won't give you a free seat if you are not disabled as a result of obesity/medical condition. A doctor is required to fill out the WestJet Medical information form within five business days of a trip.